17th April 2008. In this Issue: Mothers Day Gift Ideas, Super Special - 3 Simpson Desert Products, New Murray Valley Hwy Trek Note, New Caravan Antenna Article and Latest Directory Features. Members are making the most of the new Blogs system and it’s good to see new entries appearing almost every day. 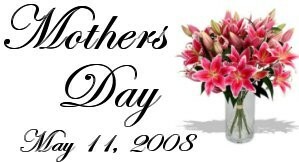 In this Mothers' Day edition of our newsletter we have a Trek Note and Article to feature, both of which have only just appeared on the site and make great reading for caravanners. The ExplorOzShop has many quality products suitable to female tastes and we're sure you'll find something special and unique. If you're looking for suggestions, Cookbooks are always a great choice, but there is a wide choice of fascinating biographies and fiction in ourInspirational Novels category. If your "Mum" is a fan of ExplorOz, then perhaps she'd appreciate something from our clothing range - the ladiesExplorOz Polo Shirts are a nice fit and look smart. We also haveGift Certificates, which can be mailed to any address you nominate. 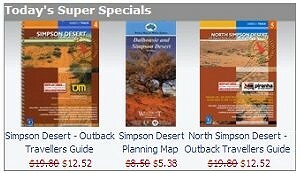 If you're planning a trip to the Simpson Desert, today's your lucky day with great discounts on this range of reference material. And don't forget to purchase yourPermit early to avoid unnecessary travel hassles. The Murray Valley Highway is one of Victoria's longest thoroughfares and essentially traces the Murray River wholly on the Victorian side of the border. This road based trek starting at Yarrawonga, takes in many towns, lakes, forests and reserves before finishing at the orange capital of Australia - Mildura. Looking for perfect TV reception in your van? In this practical article, you'll discover tips and tricks and how to make the right choice of antenna for your needs. Next time you look up a business in the Directory you'll be able to see their location pin-pointed on a street-level map view and obtain driving directions to get there. You'll also be able to view their Gallery of photos and read theirBlog as these new facilities have just been provided at no additional cost to all ExplorOz Advertisers. The search output page has also been restyled and includes a "Featured Business" window relevant to the category you are searching. Our newsletter is distributed to 29,901 subscribers on a fortnightly basis.